Conserva Irrigation, the newest addition to our Outdoor Living Brands family, is a company providing irrigation services…outdoors, of course. 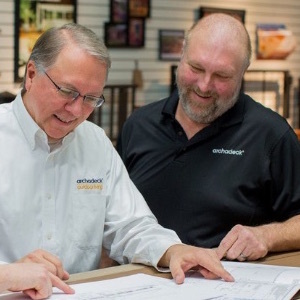 Achieving our highest levels of sales in our 14-year tenure of designing decks, porches and patios for our Des Moines-area clients. In fact, in 2017 I was the second-highest selling franchisee/owner across the national Archadeck system…also a first. Thanks to all of you who bring such great projects to our door. Surpassing – once again – our franchise’s stringent standards for annual Customer Satisfaction levels, based on the standard metrics of the Net Promoter Score system. 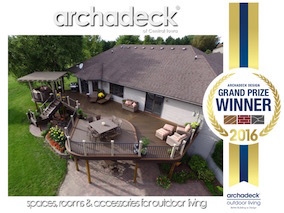 Being awarded, very early in the year, the National Grand Prize Winner for Design Excellence for 2016; this deck and pergola project is also featured in the current edition of the local Welcome Home Des Moines magazine. Being a stage presenter at the Des Moines Home + Outdoor Living Show – and being asked back again for the upcoming 2018 show. 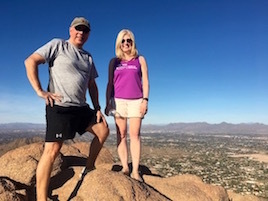 While we were in Scottsdale, my wife and I hiked and made the symbolic journeys to scale the two highest mountains in the Phoenix Mountains Preserve – Piestewa Peak and Camelback Mountain. While not the longest hikes (hey, we had meetings to attend, too!) compared to some of our Colorado adventures, they were some of the most strenuous and the scenery was beautiful. Go Cactus! And, 80-degrees in January! “Reach new heights” implies an ongoing and active effort. We are continually and actively reaching for new heights in the business of outdoor living. There are more mountains to climb…more decks, porches and patios to build; more Iowa sun to shade; more fireplaces and fire pits to light and warm a cool Iowa evening; more food to grill, serve and eat around that outdoor kitchen; more Central Iowa homeowners to satisfy. We learned a lot about the changing and increasing demand for outdoor living spaces and their functionalities in the past year. But its not only our spaces; its your overall home as well and we think its important to stay in tune there, too. Build Des Moines magazine published an article recently that nicely covered the “tone” of all this over the past year here in the Des Moines and Central Iowa market; check it out. Along with our recently-completed annual franchise convention, our past year’s experiences have us fired up for another great year and for reaching yet new heights in 2018. We look forward to hearing from you soon. Go outside and…reach new heights.